With a rear roll-bar, fixed back seats and an audacious rear wing, the GT3 is an extremely focused tool. The newest addition to the lineup, the new GT3 Touring Package, couples the aggressive chassis and 500 horsepower naturally aspirated powerplant to a more civilized interior and understated rear wing. The Touring Package recalls the optional trim level available on the 1973 Carrera RS 2.7 of 1973, and modernizes the idea. The Touring is available exclusively with a 6-speed manual gearbox and a variant of the variable rear spoiler used on the 911 Carrera. Though more visually restrained than the standard GT3, the car conceals the same motorsport technology, including the 4.0L, 500 horsepower naturally aspirated flat-six, which can propel the car to 62MPH in 3.9 seconds and on to a top speed of 196MPH. Nearly all GT3 options are available on the Touring, save for the Clubsport and Alcantara equipment packages. All of the exterior and wheel colors from the GT3 are available, as are the PCCB ceramic brakes, nose lift system, LED headlights, as well as all available seats, audio systems, and the Chrono Package. The Touring shares most of its bodywork with the standard GT3, including the car's wide track, 44mm wider than the Carrera. The front and rear valences are shared with the GT3, as are the 20" center-lock forged alloy wheels. 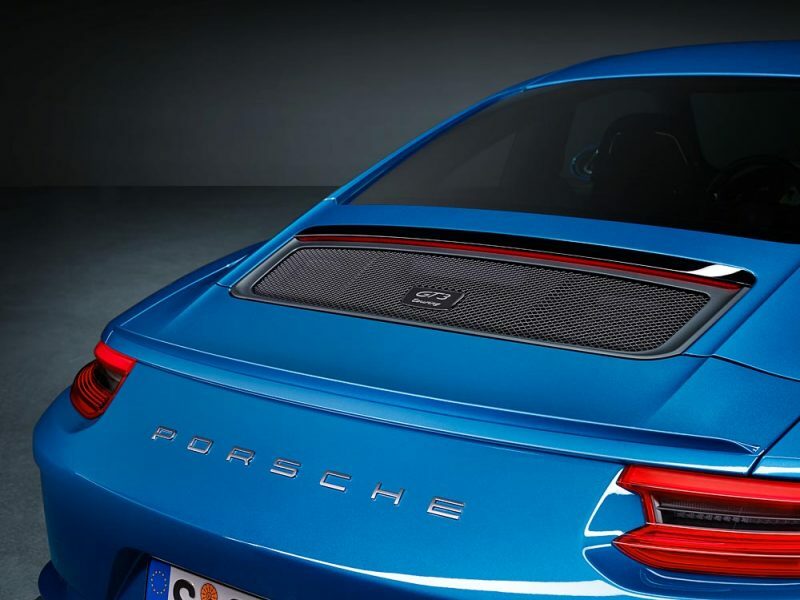 Rather than the GT3s tall rear wing, the Touring uses the variable pitch wing from the standard Carrera with an upgraded Gurney flap at the wing's trailing edge. The window trim is finished in chrome rather than black, as are the tips of the sport exhaust and the headlight washer covers, unless the "Black Exterior Touring" option is selected. Designed to evoke the feel of classic sports cars with manual gearboxes, the Touring interior is available only in leather with cloth-centered seats, with no Alcantara option. Leather extends throughout the cabin, from the 12 o'clock position marker on the steering wheel, to the door panel armrests, interior door handles and more. Brushed black aluminum trim finishes off the interior trim. Under the more restrained spoiler, the powerplant is identical to the four liter, 500 horsepower, 9,000RPM unit in the GT3. Other hallmarks of the 991.2 GT3, including rear axle steering, are retained on the Touring. The Porsche Track Precision app is included as standard, for drivers wishing to log their on-track performance and analyze data on their smartphone. The GT3 Touring Package is available to order now, and is expected to reach dealers in the US by early 2018. Pricing is identical to the standard GT3 before options, and starts at $143,600, before the $1,050 delivery, processing and handling fee. In Canada, pricing starts at $163,300 and delivery timing, while not mentioned in the press release, should be similar to the U.S.